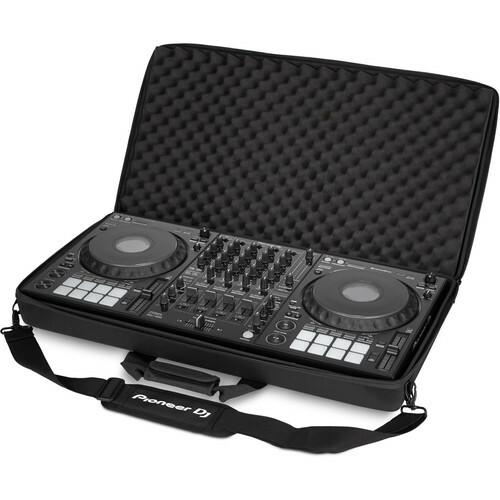 The Pioneer DJ DJC-1X BAG is a molded case that offers added protection for DJs carrying or storing a DDJ-1000, DDJ-SX, DDJ-SX2, DDJ-SX3, DDJ-RX controller on tour or moving between gigs. The durable EVA Durashock molded body is covered in black ballistic polyester, providing protection against scratches, dents, and dings. Black fleece lines the interior, and an egg-foam panel against the lid cushions the top-mounted controls of the contained controller. A zipper closure offers added security. Transporting the case is made easier by means of a handle and a detachable shoulder strap. The Pioneer DJ logo is proudly adorned across the lid of the case. Box Dimensions (LxWxH) 29.5 x 17.0 x 4.25"
DJC-1X BAG - Molded Case for DDJ Controllers is rated 4.0 out of 5 by 2. Rated 3 out of 5 by Anthony from PIONEER DDJ-1000 Controller Case This case is the bare minimum you need to transport your controller. I wish the DDJ-1000 controller could fit in the original controller case by Pioneer which I have and can also be carried like a backpack. If you have the DDJ-1000 controller you must remove the cushion on the bottom which provides less protect for the back of the unit. I think for serious traveling I prefer the Odyssey FZDDJ1000 Black Label Low Profile flight case. But like I said, DJC-1X Bag or case is the bare minimum to protect the DDJ-1000 controller. If you have a smaller controller like the DDJ-SX or DDJ-SX2 with the additional cushion placed under the unit you have a little more protection.